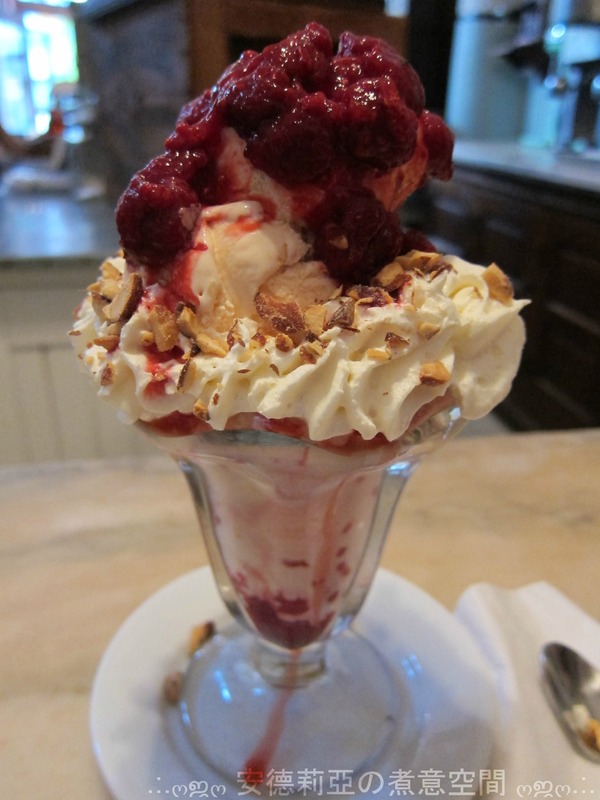 Philadelphia Eats: The Franklin Fountain | . :.ღஜღ 安德莉亞の煮意空間 ღஜღ.:. One of the best homemade ice-cream served in the city. It’s an old-school ice cream parfait. The whole store is like set-back in time 60 years ago, even their (working) telephone was one of those 1950s classic old pay phones. Everything including ice-cream and the cones are all made-in-store (2 blocks away, according to staff). They carry a very wide range of flavours. Sure their parfair and sundae menu looked sinfully amazing, but it’s not because of the old-school gimmicky decorations and the beautfifully decorated sundae that made me conclude they serve the best ice creams. Their ice cream is good enough to stand out on its own. It is not excessively oversweet, creamy and wonderfully churned. Fresh peach ice cream doused in raspberry puree, sprinkled with diced almonds and finished with a collar of ruffled whipped cream. Following soprano Nellie Melba’s performance of Wagner’s Lohengrin in 1893, French chef Auguste Escoffier was moved to create an exquisite dessert for Dame Nellie. * This is a variation of Escoffier’s famous dessert.